Feeding the child - all ages. Foods that promote growth, health, mental and physical development with specimen menus, recipes, etc. 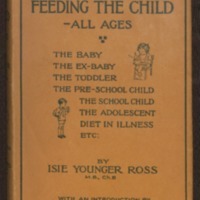 Dr Younger Ross wrote this book ‘primarily for mothers with the intent of helping them in the many difficulties which arise in feeding their children’. The book covers all stages of childhood, from five to seventeen years of age. Ross believed that mothers often found it ‘difficult to reconcile the findings of science with the practical preparation of food in the home.’ Ninety years later, families (and mothers) are still grappling with the same issues, only now with decades of research to work through.